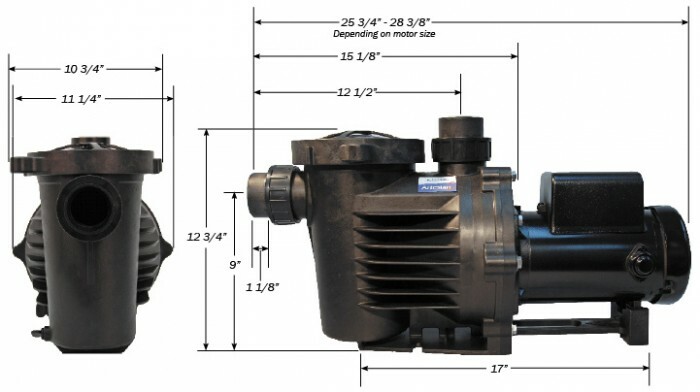 The Artesian2 Pumps are molded of tough glass reinforced polypropylene. They are extremely strong and built for long term service. Their good self-priming characteristics allow them to be positioned above the supply source. the carefully designed internal water passages provide for high flow rates with minimal noise. an easy open Lexan lid provides easy viewing and access to to the over sized strainer basket. wide range of performance conditions can be matched. self-priming design allows for suction lift placemnt. Two inch unions and tail pieces are included for easy intallation. The ArtesianPro expands on the high efficiency and self-priming advantages of the original Artesian pump series. Designed for quiet operation and enhanced performance, the ArtesianPro has 3 inch ports for great water passage at higher flow rates. A large capacity strainer basket is visible through the clear lexan lid and is readily accessible thanks to the easy to open quick clamp ring. This makes cleaning quick, easy, and painless. Large strainer basket for high flow and less clogging. unions are standard for easy cleaning. The Cascade pump line from PerformancePro is an excellent end suction centrifugal pump designed for efficient service and long term use. The PerformancePro Cascade pump line produces excellent flow rates at sufficient pressure to get the job done. Industrial strength housing provides peace of mind and a long lifetime of use. For dependable money-saving performance that is way off the chart, you can depend on PerformancePRo. Ideally suited for flooded suction applications. ready for both hard wiring or an optional cord and plug.